For everyday essentials that will make solid staples in summer, take advantage of our broad range of boys t-shirts and tops. Made of organic cotton with breathability in mind, turn to tank tops in contrasting colours and short-sleeve t-shirts in trending prints and patterns for day-to-day wear when the weather is warm. For formal occasions, team patterned polo shirts and pressed dress shirts for a sophisticated summer style that will transcend their age. To complete the look, whether casual or classy, turn to chino and denim shorts designed in a variety of contrasting colours. Build the base layers of their winter wardrobe from our classic range of boys long-sleeve t-shirts. Styled with crew necks in plain and baseball designs, wear them on their own or style them with different jackets and knitwear. Turn to pullover knits in solid core colours for an understated style, reserving college jackets in bold monochrome colours for a more striking effect. Jumpers and hoodies lined with soft warm fleece are fitting reasons for relaxation, whereas denim jeans and comfortable cotton chinos work well as dress pants or basics for back-to-back wear in winter. For stylish swimwear that’ll make a splash in the summer, take advantage of our broad selection of boys swimsuits and swimwear. Turn to plain swimming trunks fitted with elasticated waistbands and internal draw cords for competitive swimming, reserving board shorts in bold colours and flamboyant prints for pool parties and big days at the beach. When the water cools down but your boys still want to surf, utilise our range of rash vests in long and short-sleeve styles to protect them from the sun and keep them warm in the water. Ensure your boys are getting the rest they deserve after a long day of activities with our plush range of pyjamas and sleepwear. Short-sleeve pyjama sets made of slinky satin fabrics are the perfect choice for combatting hot nights in summer whereas long-sleeve pyjama sets made of warm flannelette fabrics will retain all the warmth they need to sleep right through the night in winter. Add the perfect finishing touches to their look with our extensive edit of boys accessories and essentials. Choose from caps and hats that will keep their face sheltered from the sun and character printed backpacks that will safely secure all their school things. A stylish selection of boys shoes, from sandals and thongs to trainers and boots, will keep their feet shielded from risk while they run to and fro. 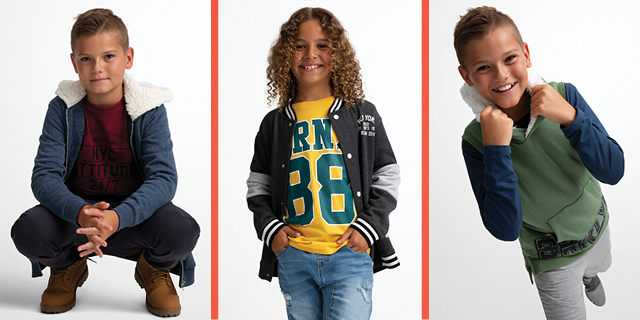 Best&Less is host to an array of favourite kidswear brands including Bad Boy, Bonds, Cars, Disney and more. Whether it’s a classic collection of clothes you’re after or an array of on-trend accessories, you’ll find everything your boy needs online at Best&Less.